December blue skies above the wonderfully secluded beach of Porth Ceiriad is this weeks photo from John Wormald. 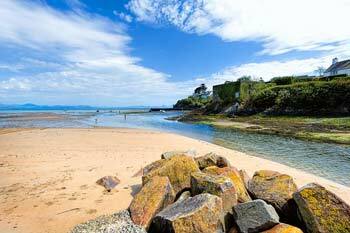 Porth Ceiriad is a great place to escape the summer crowds. The photo was taken by John on 21/12/2016 and it was updated on this page on 22/12/2016. A classic morning view, looking across a tranquil bay, from the beach huts at the WG Williams end of Abersoch main beach, with St. Tudwal's Islands in the distance. The photo was taken by John on 19/12/2016 and it was updated on this page on 19/12/2016. 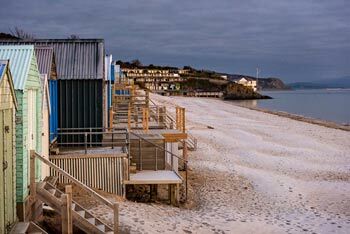 No frosty beach views this week with the weather turning milder, but a very nice shot from John capturing this view looking out across the beach and bay. 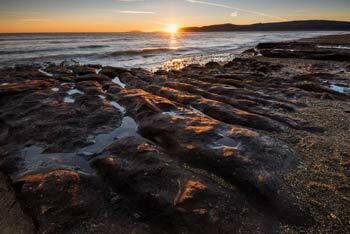 The photo was taken by John on 11/12/2016 and it was updated on this page on 11/12/2016. A frosty way to end autumn 2016 in Abersoch, with the main beach turning white at times. 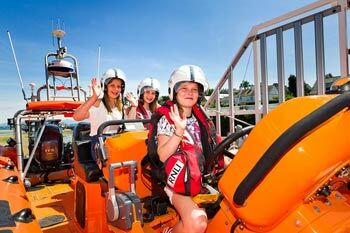 The autumn weather has been in stark contrast to the storms of 12 months ago! The photo was taken by John on 30/11/2016 and it was updated on this page on 04/12/2016. The scene outside the Vaynol Arms in the centre of Abersoch during Friday evening's annual Abersoch Christmas Festival. The photo was taken by John on 25/11/2016 and it was updated on this page on 27/11/2016. 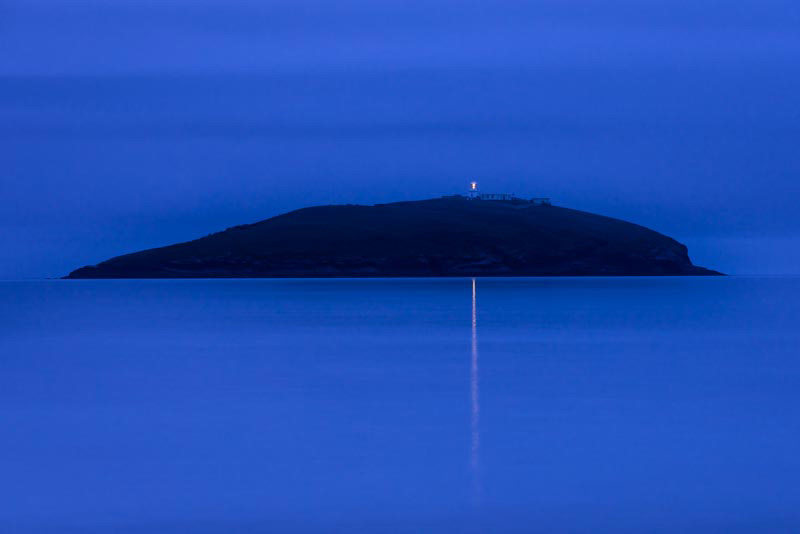 A view looking across the bay this week, towards St. Tudwal's Island West, with the working automated lighthouse clearly visible. 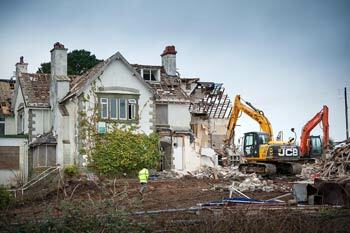 The photo was taken by John on 15/11/2016 and it was updated on this page on 19/11/2016. A view from the bridge over the Afon Soch, Abersoch, looking across the inner harbour with Abersoch Lifeboat Station in the distance along with Llanbedrog Headland (the source of some controversy this week - see the news section). The photo was taken by John on 10/11/2016 and it was updated on this page on 12/11/2016. This week we have a guest photographer as John is away and we welcome back the talented Phil Boyd, who is also the head chef at Zinc in Abersoch. Phil captured this shot of the sun going down, from Cilan Head and you can just see Bardsey Island / Ynys Enlli on the horizon. 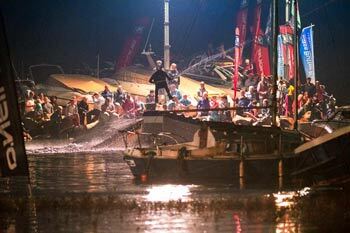 04/11/2016 and it was updated on this page on 05/11/2016. 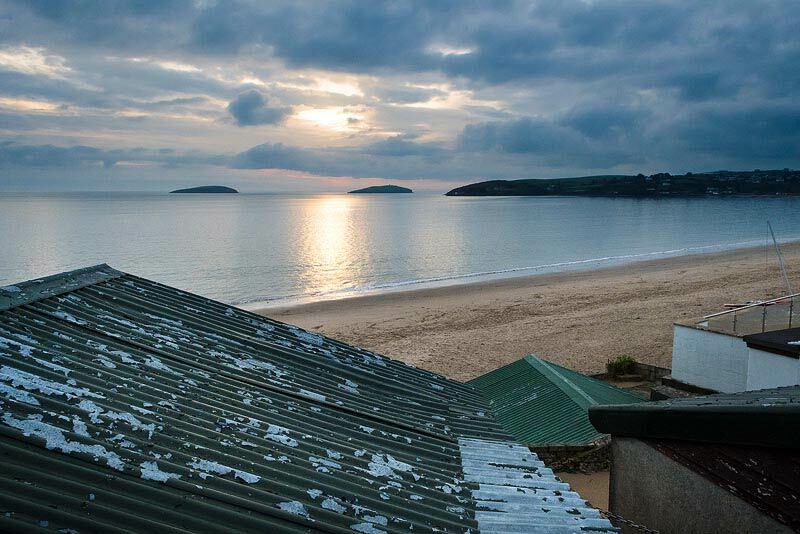 An early morning shot taken by John on the last day of October, of a very quiet and still Abersoch Bay with St. Tudwal's Islands and the hills and mountain of Snowdonia in the distance. 31/10/2016 and it was updated on this page on 31/10/2016. 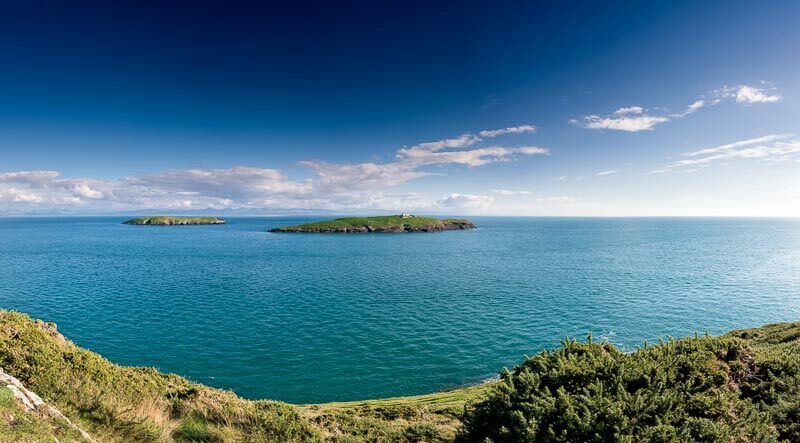 Abersoch and the Llyn Peninsula provide unlimitied opportunities for capturing wonderful photos and today is a classic example with John using a multi image panoramic technique to capture this beautiful shot of St. Tudwal's Islands from the Wales Coastal Path on a sunny October, Saturday afternoon. 22/10/2016 and it was updated on this page on 22/10/2016. 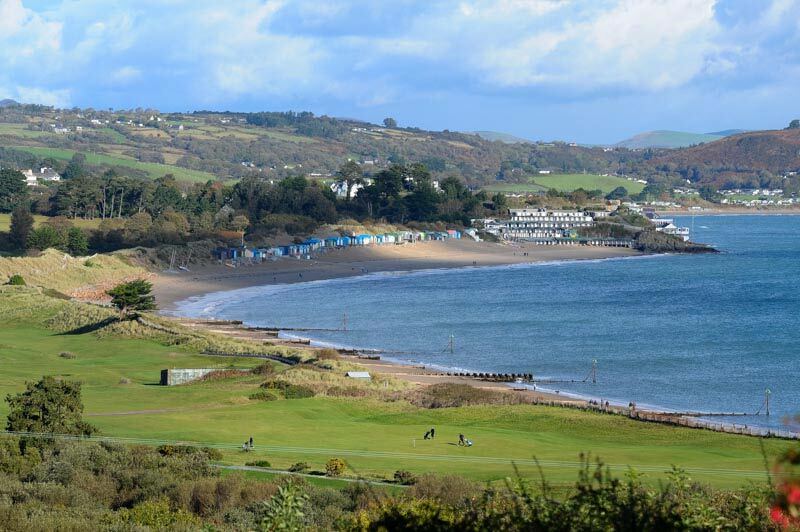 A view of part of the links of Abersoch golf course, with the main beach, sand dunes, beach huts and the yacht club visible too, with Mynytho in the background. 15/10/2016 and it was updated on this page on 15/10/2016. A photo taken in the early evening from Zinc Bar in Abersoch overlooking Abersoch Boatyard Services's yard. 05/10/2016 and it was updated on this page on 08/10/2016. 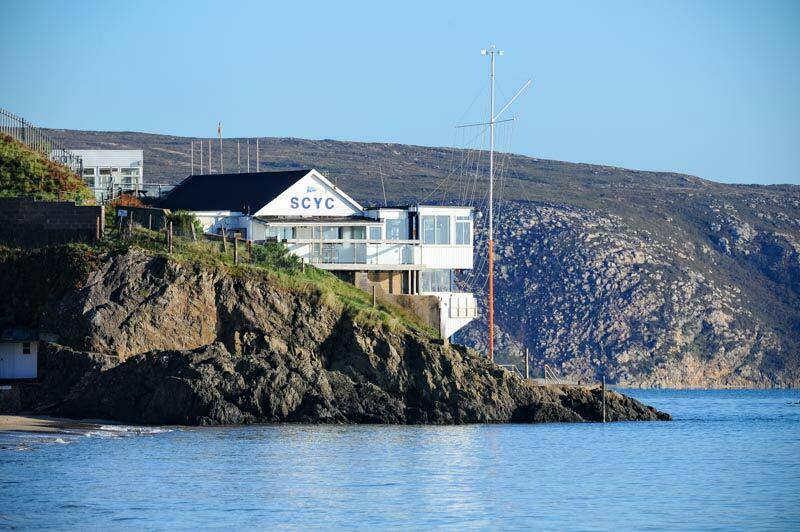 A view of SCYC, that sits at the northern end of Abersoch main beach, with Llanbedrog headland in the background, taken on a beautiful, first Sunday of October on the Llyn Peninsula. 02/10/2016 and it was updated on this page on 02/10/2016. 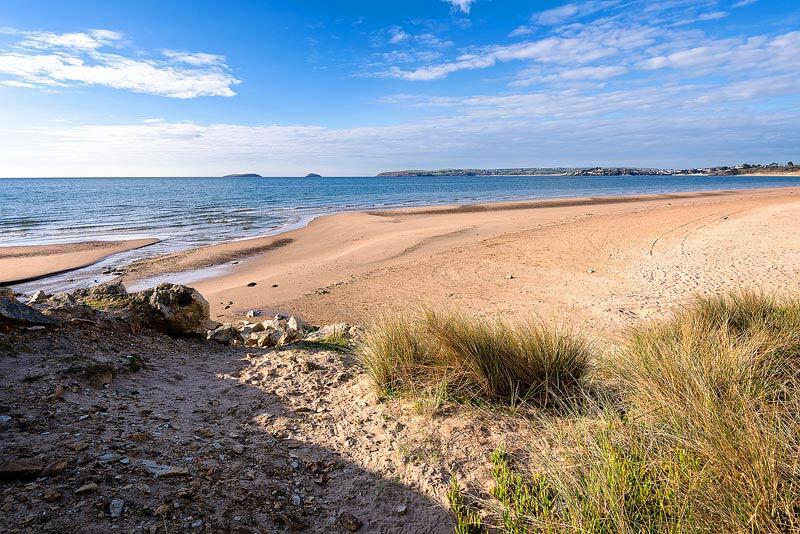 A beautiful morning view taken from the stretch of sand that is uncovered at some states of the tide, that lies between the Abersoch main and harbour beaches. 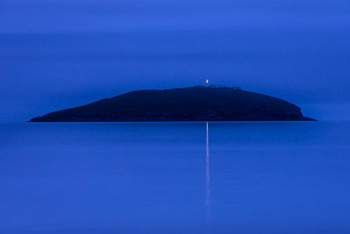 The SCYC jetty is shown, with St. Tudwal's Islands in the distance, across a glassy bay. 22/09/2016 and it was updated on this page on 26/09/2016. A classic view from John this week of Abersoch outer harbour, where the Afon Soch enters the sea. 16/09/2016 and it was updated on this page on 18/09/2016. 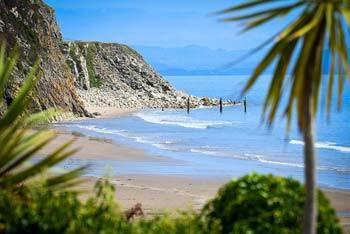 A view of the quarry end of the Warren beach along with the tip of Llanbedrog headland. 07/09/2016 and it was updated on this page on 10/09/2016. 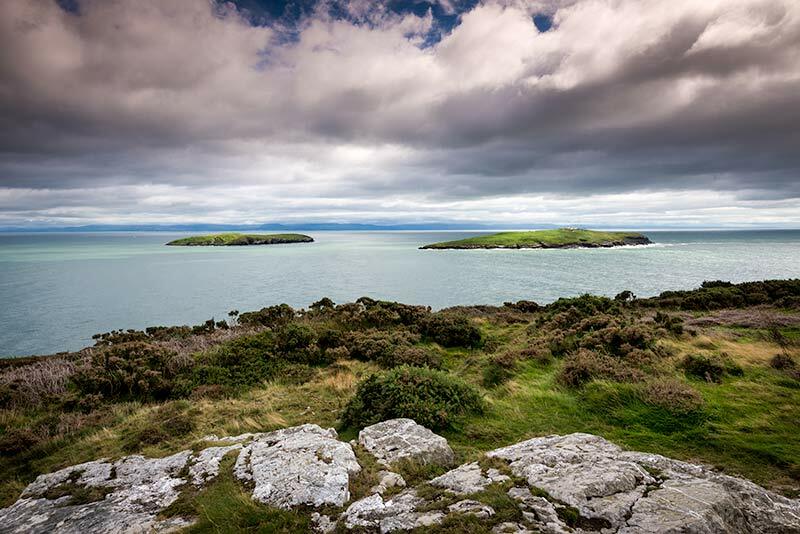 A shot overlooking the famous St. Tudwal's Islands captured by John for this week's photo, with the lighthouse island of St. Tudwal's West in for foreground, with St. Tudwal's East a little bit further away. The sound between the Islands and the headland at Wylfa, can see some big seas during storm conditions. 04/09/2016 and it was updated on this page on 05/09/2016. After the storm of last weekend, a much more tranquil scene greeted John this morning down by SCYC and he captured this stunning early morning view, looking north towards Llanbedrog Headland and Snowdonia. 27/08/2016 and it was updated on this page on 27/08/2016. Not a sight we normally see in August with a powerful Atlantic storm battering the area today, producing some large waves on Abersoch main beach! 20/08/2016 and it was updated on this page on 20/08/2016. 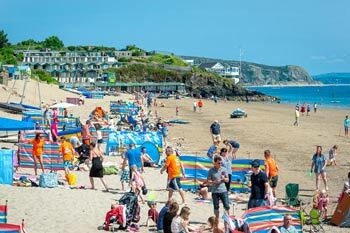 Abersoch Inner Harbour played host to the annual spectacular Glass Butter Beach "Harbour Project" with wakebaorders riding obstacles and jumps, towed by an ingenious cable tow. 18/08/2016 and it was updated on this page on 20/08/2016. 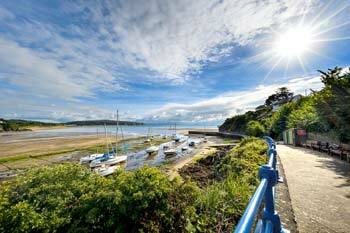 The view from the path towards the Abersoch outer harbour wall and slipway on a sparkling Abersoch morning. The Warren beach and Llanbedrog headland can be seen centre-left of the photo with Snowdonia blanketed in cloud on the horizon. 13/08/2016 and it was updated on this page on 15/08/2016. 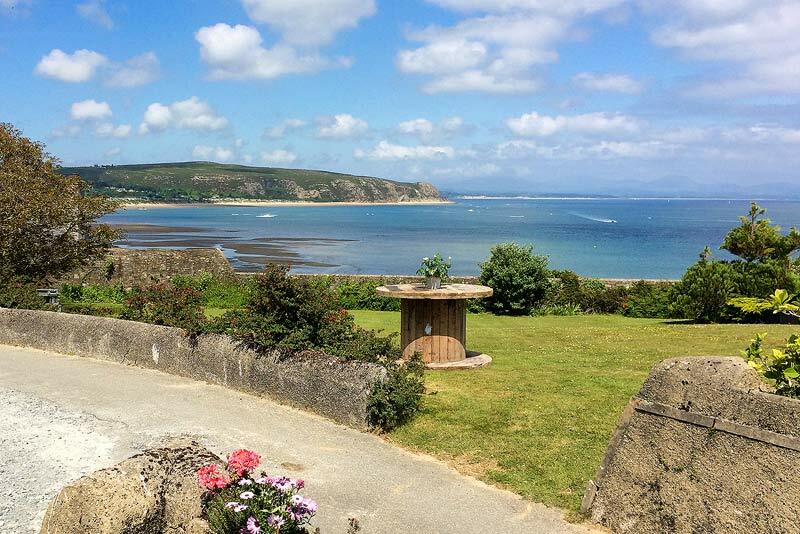 The first Round Pen Llyn Ultra Marathon took place on Saturday 6th August, with clear skies and warm sunshine for much of the day. 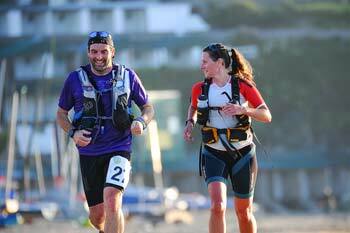 John took this photo of 2 of the runners making their way to the first checkpoint on Abersoch main beach, with the beach huts in the background. 06/08/2016 and it was updated on this page on 08/08/2016. 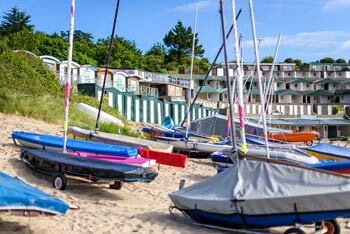 Sailing dinghies on Abersoch main beach with the famous W&G Williams beach huts in the background. The last week has been the annual Abersoch Dinghy Week, with hundreds of sailing enthusiasts enjoying a week of racing in the bay off Abersoch. 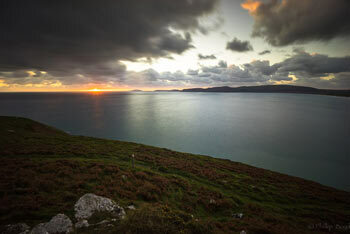 The weather has been mixed for them this week, but they did get some decent wind at times. 30/07/2016 and it was updated on this page on 30/07/2016. 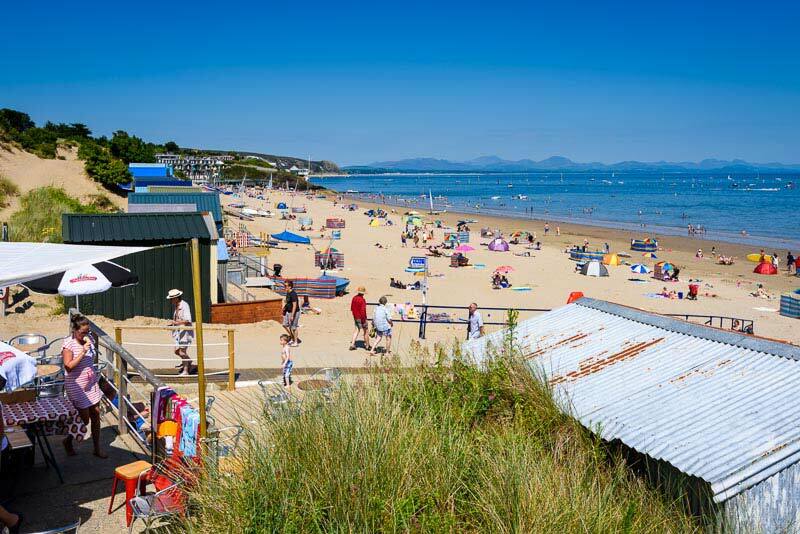 A view looking along Abersoch main beach on the hottest day of the year (so far) with the Beach Cafe in the foreground and Snowdonia on the horizon. 19/07/2016 and it was updated on this page on 23/07/2016. 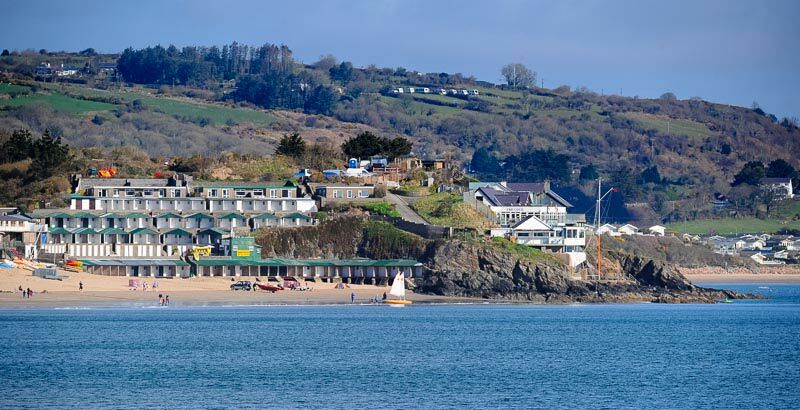 A classic Abersoch view.. looking across from the cafe at the SCYC end of Aberaoch main beach, across the bay and moorings, to St. Tudwal's Islands and the Penryn Du, where the old lifeboat station is located. 14/07/2016 and it was updated on this page on 17/07/2016. 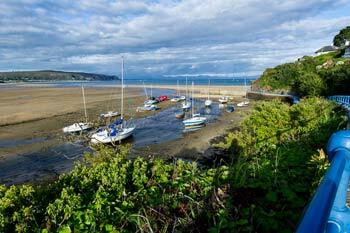 Looking across Abersoch harbour towards the harbour wall, with boats moored in the distance. 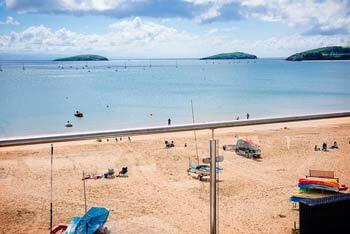 The buoys in the foreground are used for the mooring of boats in the bay off Abersoch. These deep water moorings are still popular, due to the relative shelter of Abersoch Bay, but less so, since the building of the marina in nearby Pwllheli. 03/07/2016 and it was updated on this page on 09/07/2016. 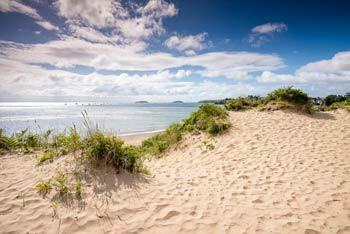 A view from the dunes behind part of the Warren beach looking across a breezy bay, towards St. Tudwal's Islands. 02/07/2016 and it was updated on this page on 02/07/2016. 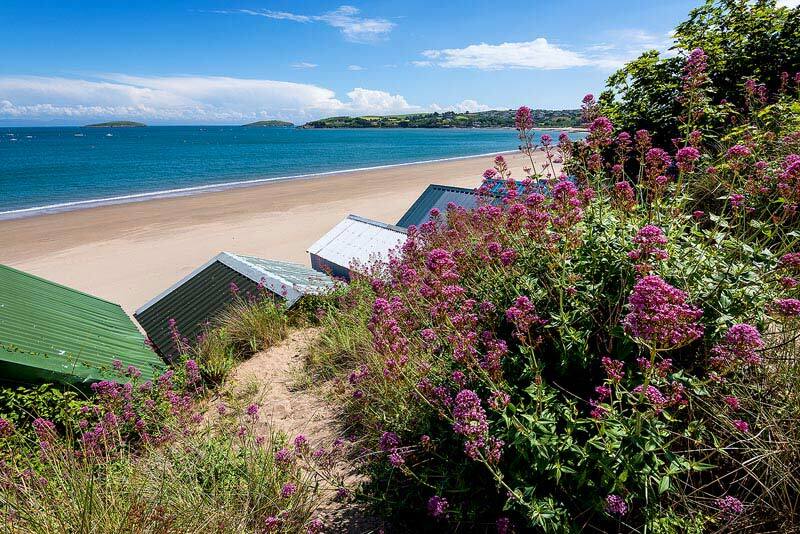 It was a case of it being a weekend of mixed weather fortunes for Abersoch, with some fine weather on Saturday, which was captured beautifully by John Wormald with this shot looking over the rooves of the beach huts on Abersoch main beach, with St. Tudwal's Islands in the distance. 25/06/2016 and it was updated on this page on 27/06/2016. A sunny view from one of the houses on Bennar headland, Abersoch, looking towards Llanbedrog headland. 18/06/2016 and it was updated on this page on 20/06/2016. Early morning looking across Abersoch inner harbour with the lifeboat house just visible on the left of the photo and Compass Cottage, one of the older cottages in the village, on the right hand side. The old lime kiln is also visible near to the upper centre of the photo. 06/06/2016 and it was updated on this page on 12/06/2016. 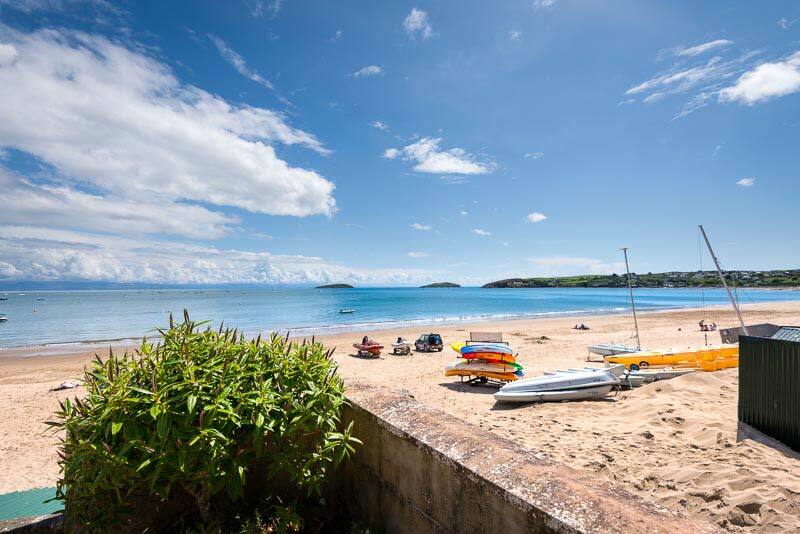 Blue skies again over the main beach in Abersoch after a week of fantastic weather on the Llyn Peninsula and one of the better Whitsun hiliday weeks of recent years. 04/06/2016 and it was updated on this page on 04/06/2016. 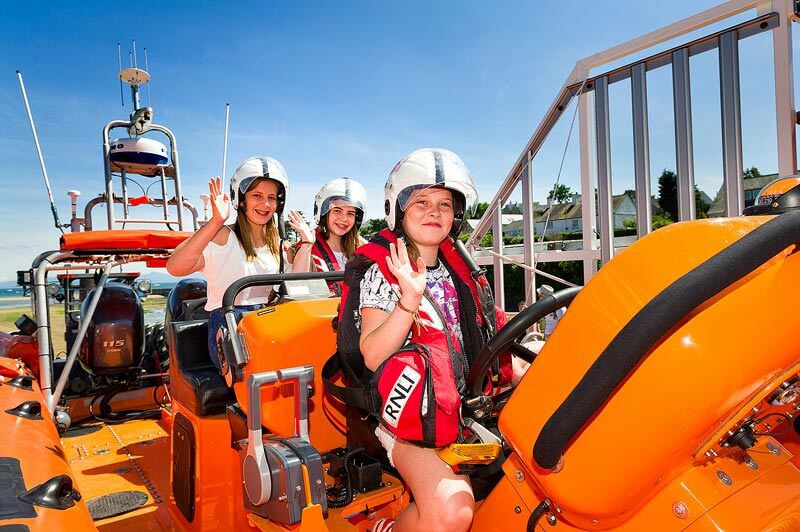 Blue skies have been a feature of the bank holiday weekend and they remained clear and blue for the annual open day down at Abersoch RNLI Lifeboat Station. 30/05/2016 and it was updated on this page on 30/05/2016. 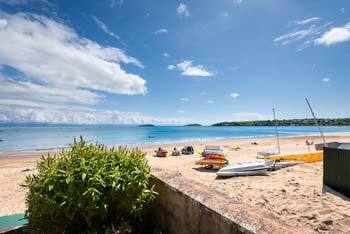 A view across Abersoch main beach on a sunny Sunday afternoon with St. Tudwal's islands in the distance and the boats of Abersoch Sailing School in the foreground. 22/05/2016 and it was updated on this page on 22/05/2016. 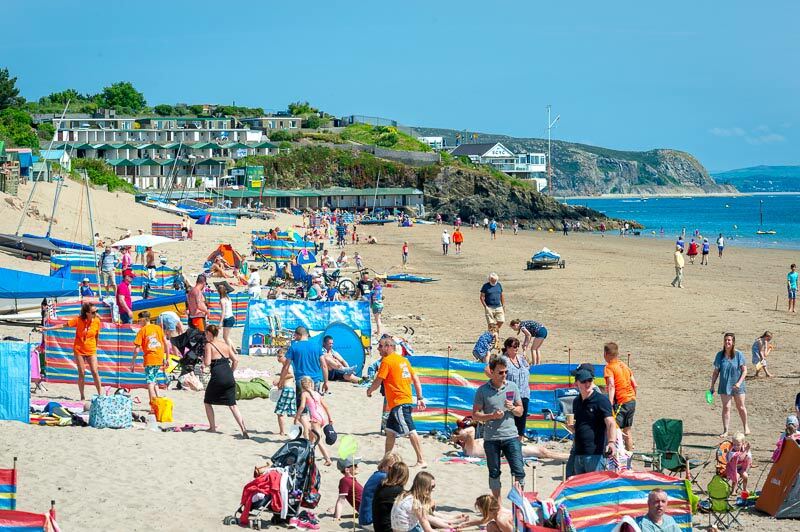 Abersoch has seen some sparkling weather at times in the last few days and this image was taken from the beach huts at the Bwlchtocyn end of the main beach. 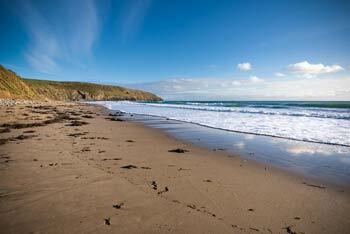 This end of the beach is generally a quieter option and also gets some shelter in southwesterly winds. 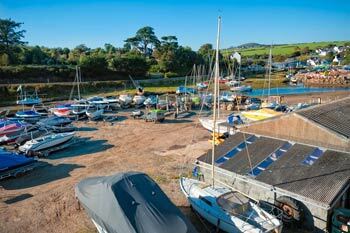 There is also a new cafe at the boatyard, next to the small car park. 13/05/2016 and it was updated on this page on 14/05/2016. 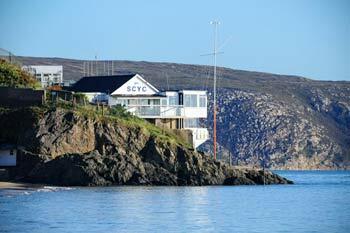 A view from close to the Abersoch RNLI Lifeboat Station, with the mouth of the River Soch flowing into Abersoch Outer Harbour. The old lime kiln is visible, as is the harbour wall in the distance. 08/05/2016 and it was updated on this page on 08/05/2016. Contrasting colours on a showery April day. This shot was taken near to Abersoch Garden Centre with the lighthouse on St. Tudwal's West Island visible and shower clouds moving down the west coast of Wales in the background. 27/04/2016 and it was updated on this page on 30/04/2016. 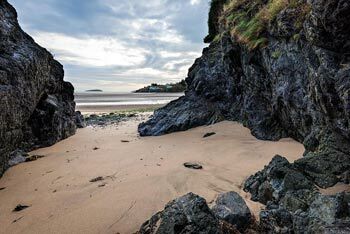 An early morning view from the quarry end of the Warren beach, just below Llanbedrog Headland, looking towards Abersoch, Bwlchtocyn and St. Tudwal's Islands. 23/04/2016 and it was updated on this page on 23/04/2016. 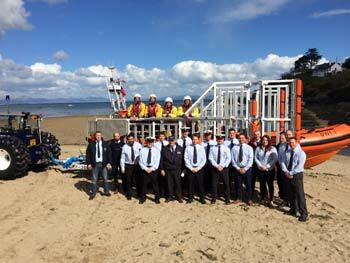 It is always a big day in Abersoch when a new lifeboat receives its official naming at a ceremony at the RNLI station in the village. 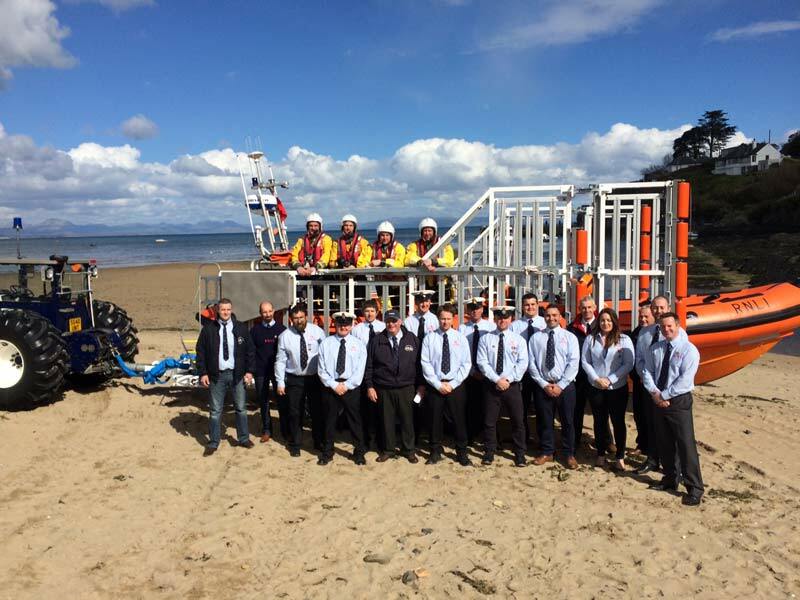 The new Atlantuc 85 lifeboat that arrived last autumn, and the dedicated volunteers who crew her, will continue to provide a year round, 24 hours of the day rescue service for those in peril on the sea. 16/04/2016 and it was updated on this page on 16/04/2016. 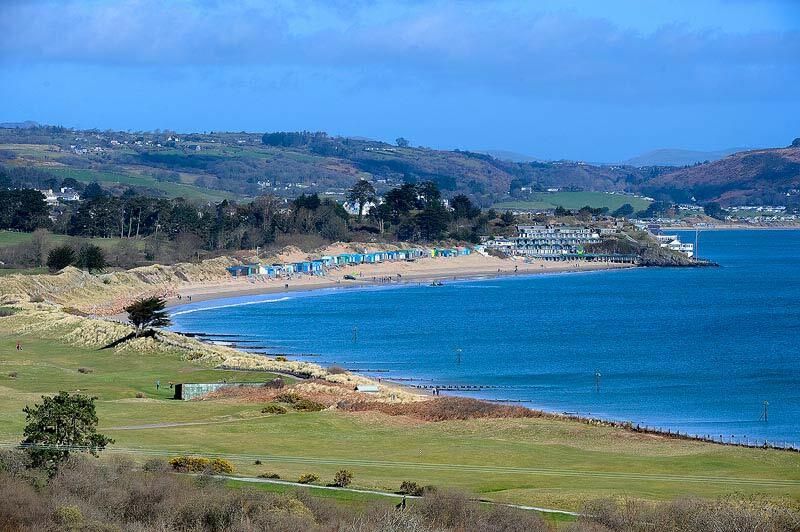 A recent view looking across from the Bwlchtocyn end of the main beach towards the yacht club and beach huts of Abersoch. 05/04/2016 and it was updated on this page on 12/04/2016. 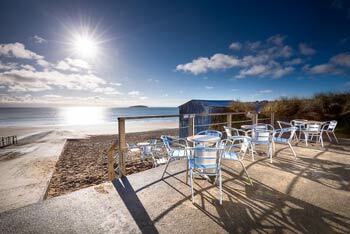 A sparkling, March morning view from the beach cafe at the Golf slipway on Abersoch main beach. 30/03/2016 and it was updated on this page on 02/04/2016. 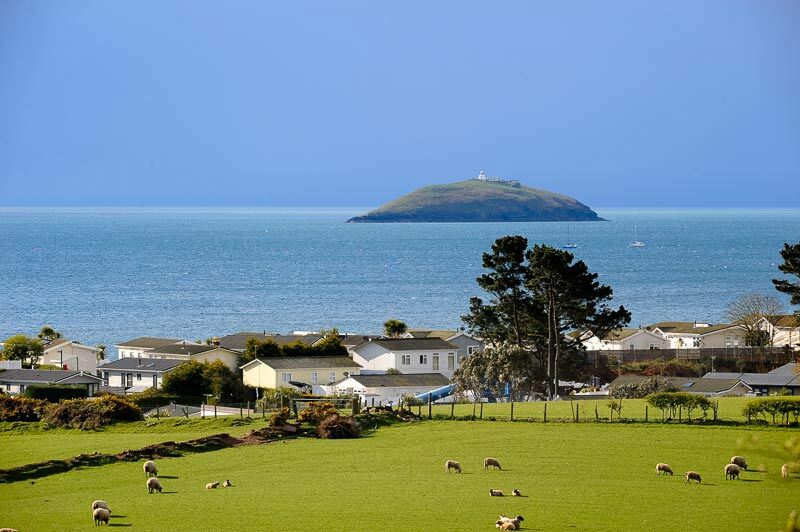 The sun shone and the skies were blue above Abersoch on Good Friday and John was out and about taking advantage of the fine, March weather, before the expected storm of Easter Saturday. This photo is looking across the links of Abersoch golf course, down the main beach, with its numerous beach huts. 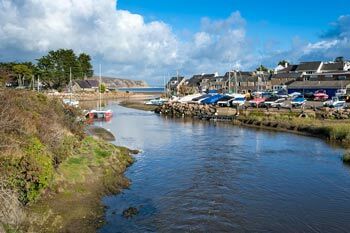 The photo was taken by John Wormald on 25/03/2016 and it was updated on this page on 26/03/2016. The photo was taken by John Wormald on 18/03/2016 and it was updated on this page on 19/03/2016. A wonderful photo from John this week of a sunset at Porth Neigwl with the "petrified forest" in the foreground. These remains of the old forests of Wales, that were submerged around 5000 years ago can be seen sometimes on very low spring tides, especially after stormy periods when there is less sand on the beach. 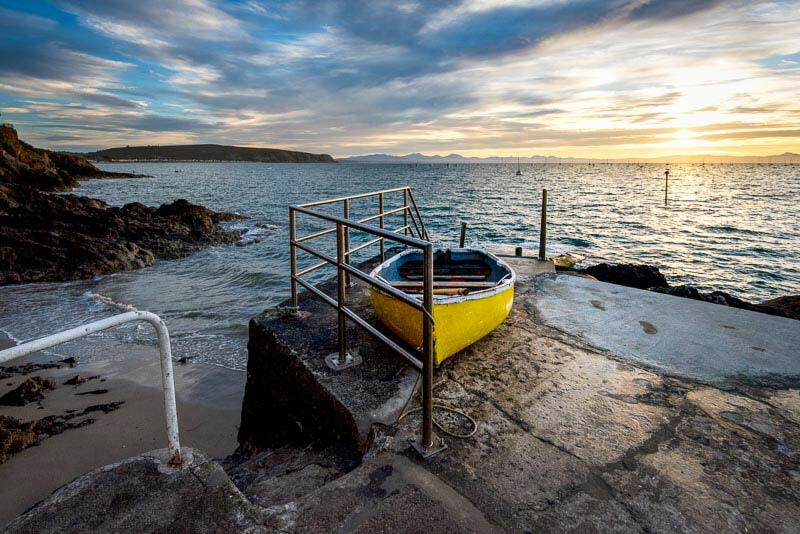 The photo was taken by John Wormald on 10/03/2016 and it was updated on this page on 12/03/2016. 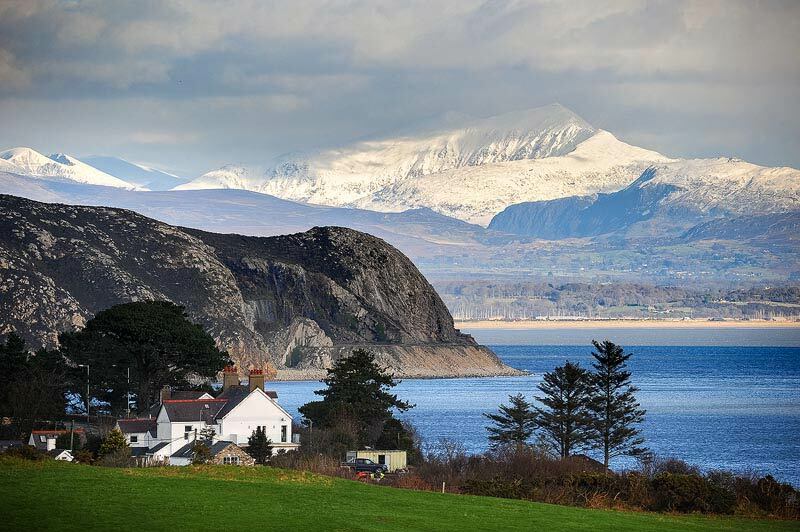 A wintry view, captured by John, on an early spring day looking across from Abersoch towards the snowy hills and mountains of Snowdonia, with Llanbedrog Head in the foreground. 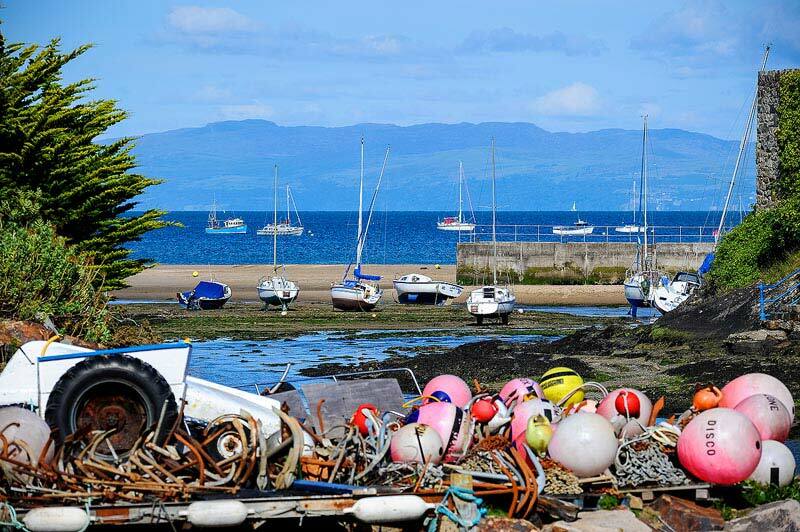 The photo was taken by John Wormald on 05/03/2016 and it was updated on this page on 05/03/2016. 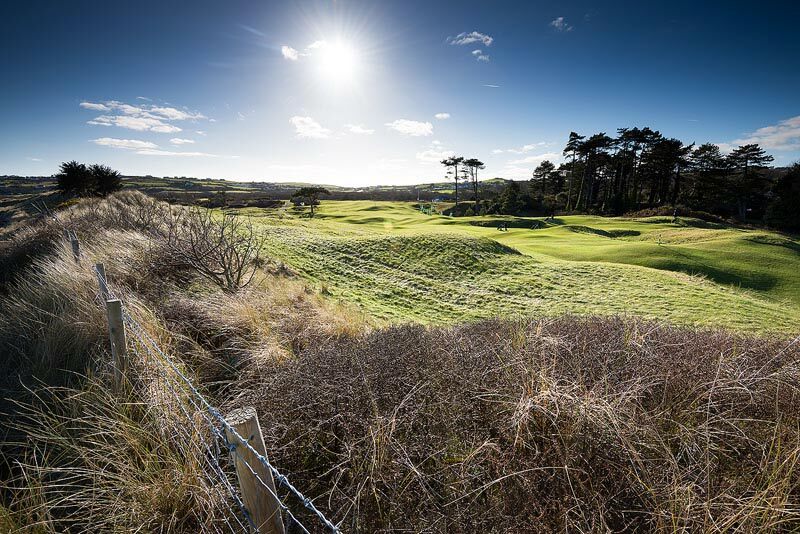 A sparkling blue sky view this week from local photographer John Wormald, with a shot of the links at the beautiful Abersoch Golf Course. The views from elevated links tees at the southern end of the course are breathtaking. 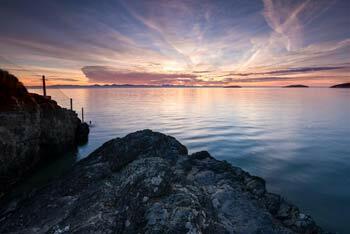 This shot is looking towards the southwest from the SCYC end of the beach. 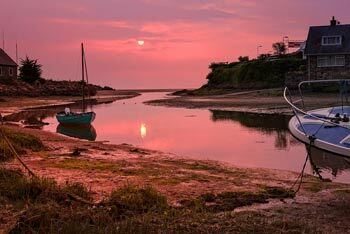 The photo was taken by John Wormald on 23/02/2016 and it was updated on this page on 27/02/2016. 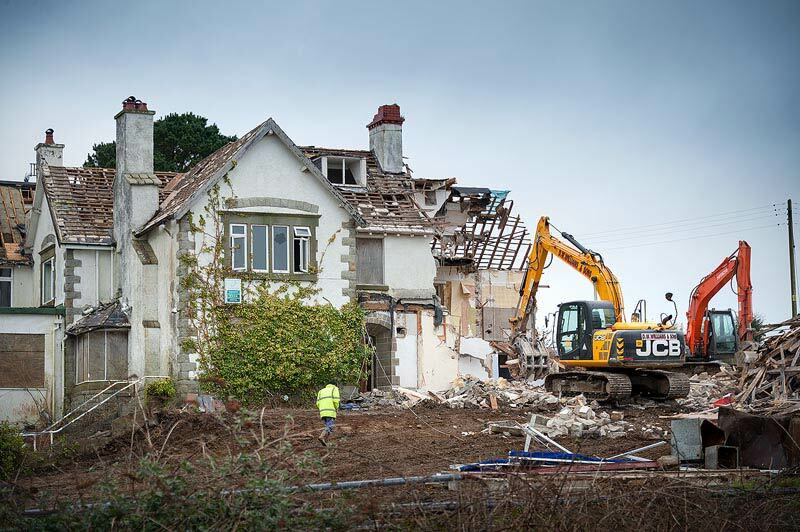 The end of an era as the former White House Hotel, that has been derelict for several years is demolished, to be replaced by a luxury 42 bedroom hotel and spa complex, with also a number of apartments, bars and a restaurant. 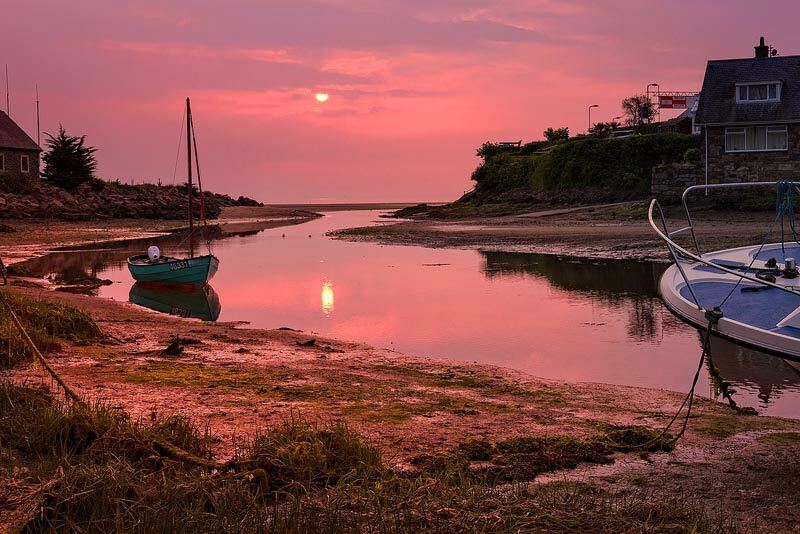 The photo was taken by John Wormald on 19/02/2016 and it was updated on this page on 20/02/2016. 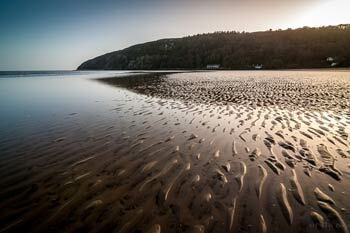 A stunning shot this week taken at low tide at Porth Neigwl (Hell's Mouth) near Abersoch, showing the effects the waves and currents have on the sea bed. The photo was taken by John Wormald on 10/02/2016 and it was updated on this page on 13/02/2016. 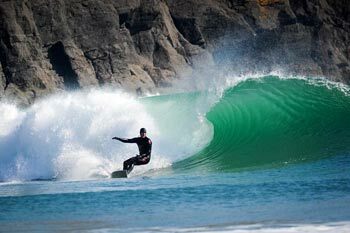 John Wormald is away this week and so... the chef is back... which is of course our regular contributor Phill Boyd, whose daytime (and evening) job is in the heat of the Zinc kitchen, and he has captured this wonderful shot of the surfing waves at a well known local beach this week. 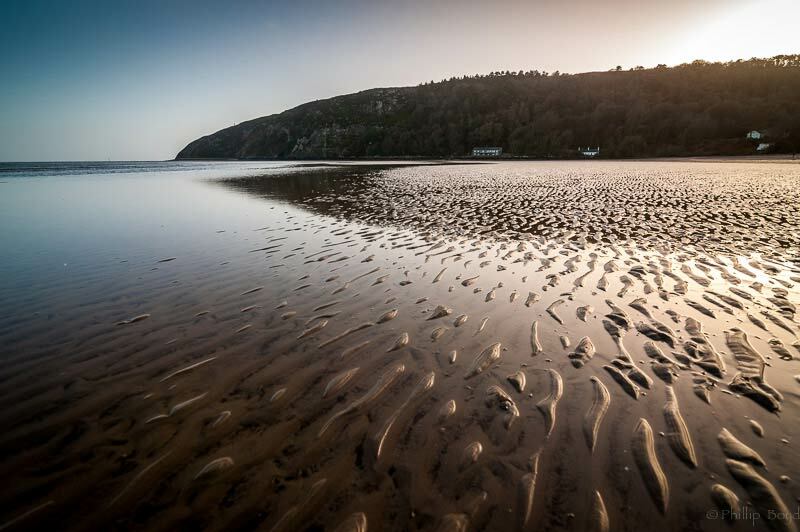 The photo was taken by Phill Boyd on 02/02/2016 and it was updated on this page on 06/02/2016. 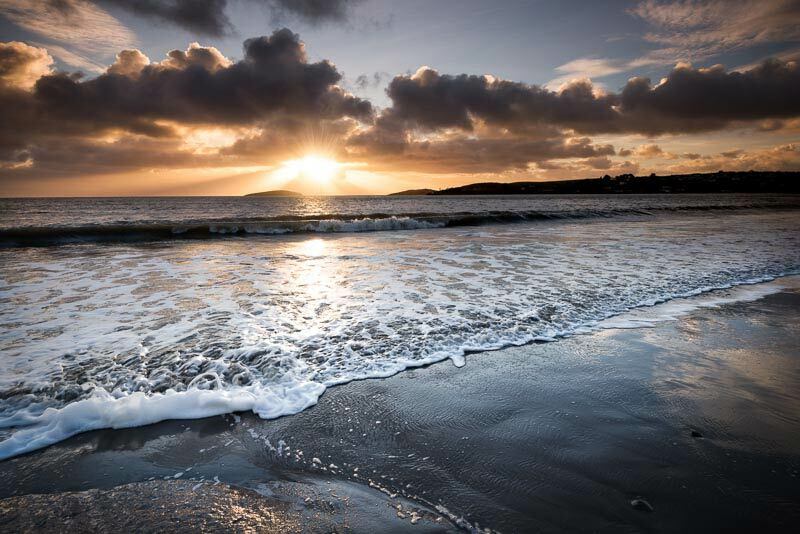 John Wormald is back behind the camera lens this week with a recent shot of the sun rising over St. Tudwal's Islands, taken from Abersoch main beach. 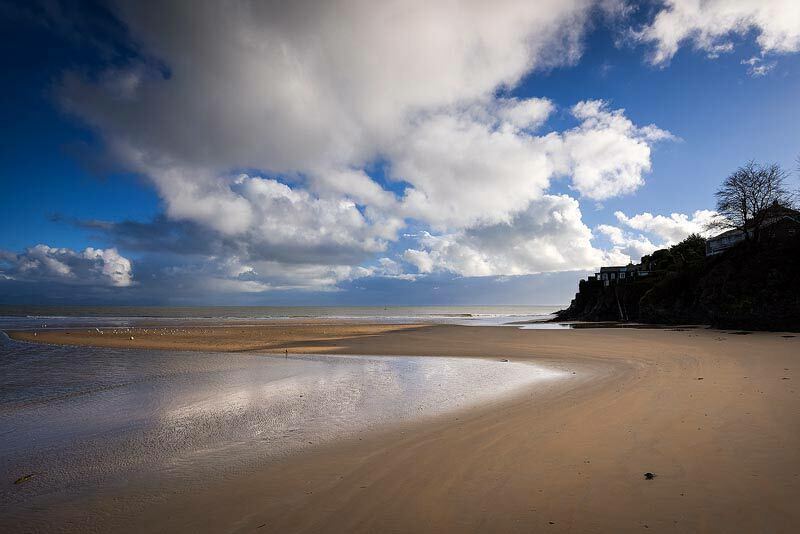 The photo was taken by John Wormald on 28/01/2016 and it was updated on this page on 30/01/2016. 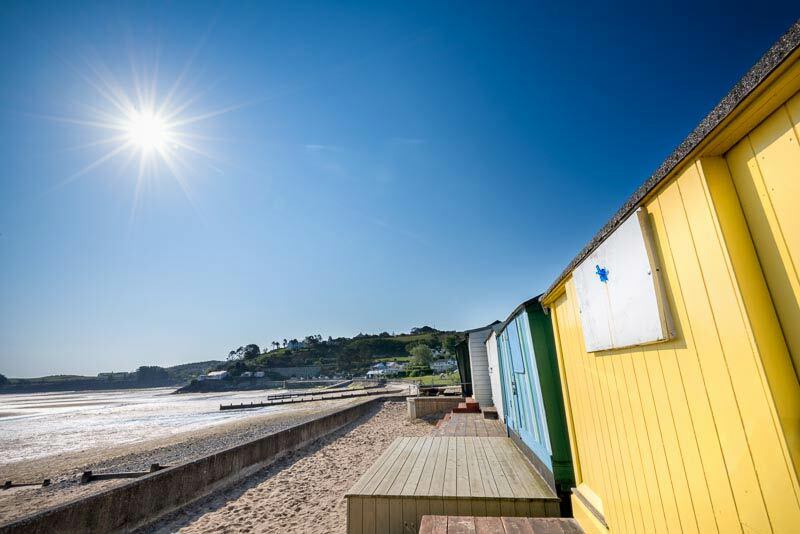 John's stand in this week is Phill Boyd who has taken this lovely shot of Llanbedrog beach during the afternoon after some rain and fog had cleared to leave a lovely end to the day. 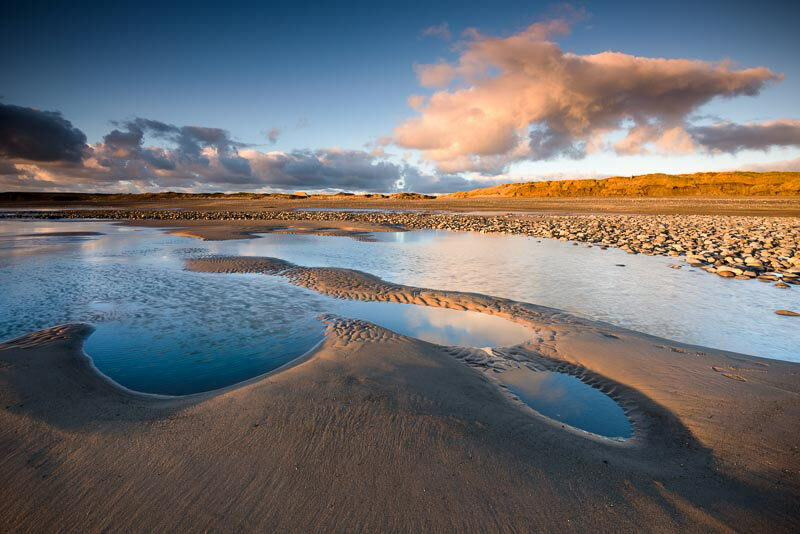 The photo was taken by Phill Boyd for John Wormald on 22/01/2016 and it was updated on this page on 23/01/2016. 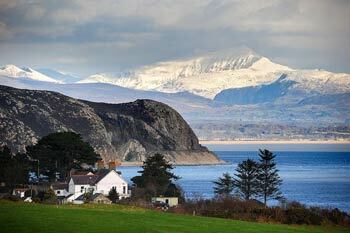 Looking across to a very snowy Snowdon from Abersoch, with a first taste of winter for North Wales. 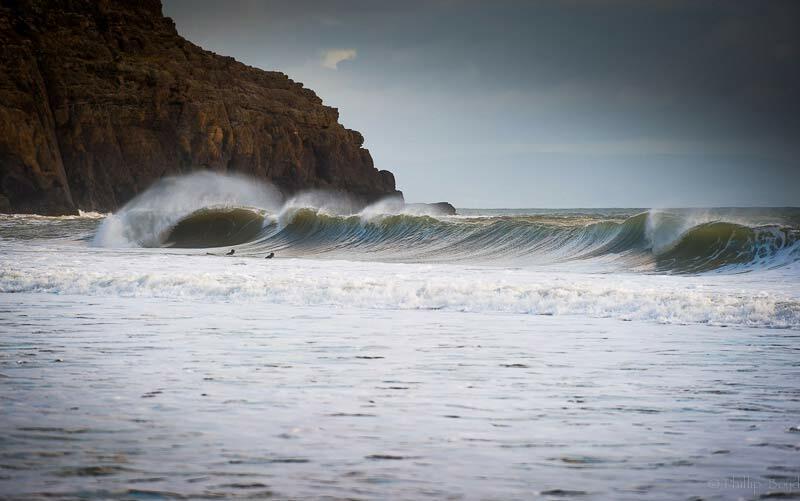 The photo was taken by John Wormald on 15/01/2016 and it was updated on this page on 16/01/2016. The view from the out harbour wall at Abersoch, with the harbour beach in the foreground. The part of the beach in the picture is tidal, and is covered by water on each high tide. 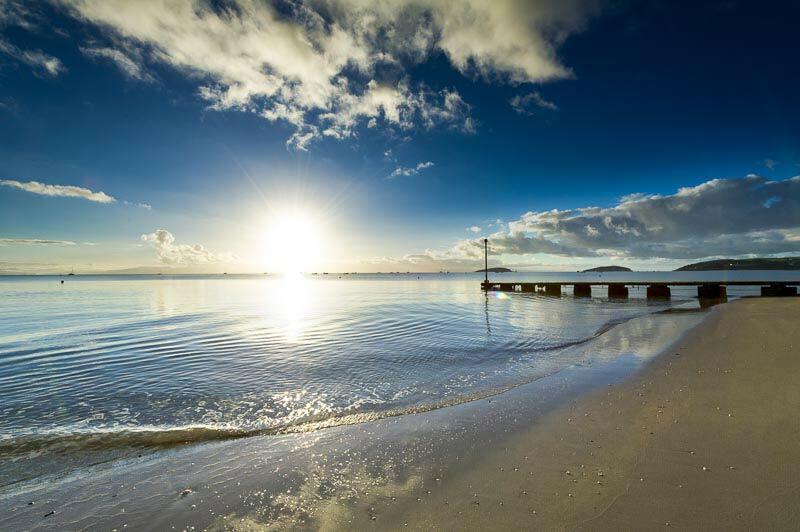 The photo was taken by John Wormald on 08/01/2016 and it was updated on this page on 09/01/2016. 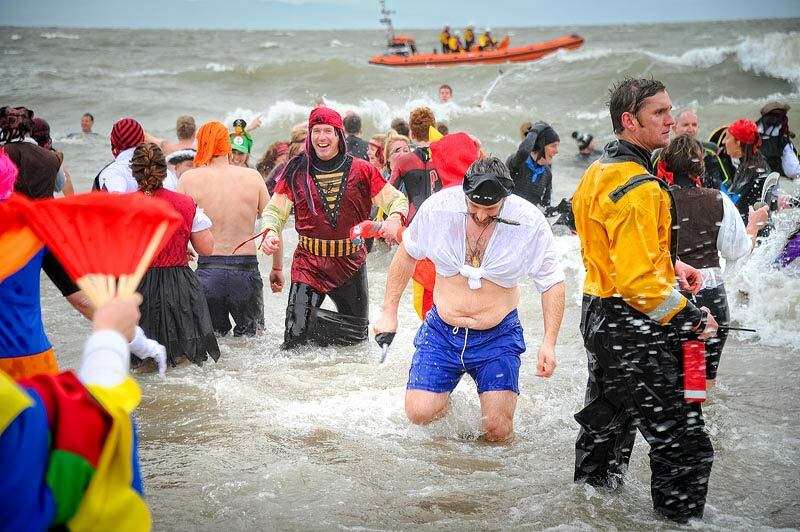 The annual Abersoch RNLI sponsored sea dip took place on the main beach on New Year's Day in conditions slightly more challenging than usual. 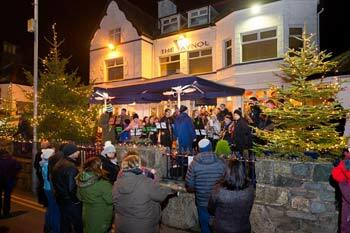 John has captured many wonderful images of the event and you can access the photos on his website by clicking here. 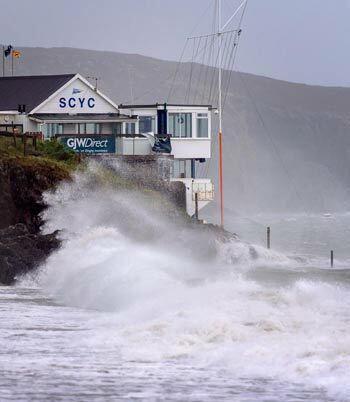 The photo was taken by John Wormald on 01/01/2016 and it was updated on this page on 02/01/2016.